Provide comfort for the family of Alice M. Dyer with a meaningful gesture of sympathy. 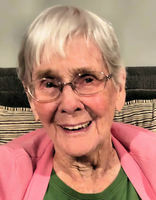 Alice M. Dyer, 98, passed away on Friday, February 8 at The Meadows, Old Town. She was born on June 27, 1920. She had 62 years of a loving marriage to Arnold Dyer before his death in 1999. Alice, the daughter of Grover and Edna (Nelson) Wardwell, was predeceased by her six brothers and three sisters. She was a kind, sweet and giving woman, however she spoke out for what was right long before it was popular, much to the admiration of the female members of her family. Alice loved her family, her church and God’s gift of nature. Arnold and Alice made their home in Presque Isle. There they worked together to raise their family until the birth of their first grandchild, which prompted them to move to Bangor to be closer. There were a total of 4 grandchildren filling both the arms and laps of “Nana” and “Poppy”. Alice became a member of the United Methodist Church in 1937. She loved working in any capacity needed for God and her church. Alice taught first grade Sunday School for 12 years, was a member of the Dorcas Circle in PI, the Piburn Circle in Bangor and served as Vice President and then President of the United Methodist Women for two terms in Presque Isle. Alice and Arnold also became members of the Riverside Grange #273 of No. Brewer and Pamona #8. She served as Secretary, Chaplin and Lecturer during her involvement. Alice enjoyed gardening and grew both flowers and vegetables. 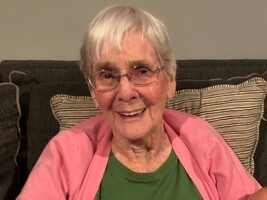 Although she was a homemaker and best known for her bread making abilities, she also worked seasonally for UMaine and the USDA on potato research projects. Alice will be missed by the family she adored. She leaves behind her two daughters, Judi and Ralph Collier (Bangor) and Gail Dyer-Martin (Hollis, NH). Four grandchildren; April Cottle and Tim, Matthew Collier and Kathryn Parker, Annemarie Bellavance and David and Caitlyn Daisy and Brian. Eleven great grandchildren, who lovingly referred to her as “Big Nana” or simply “Big”; Jacob, Ashton, Izaac, Isabella, Mason, Trey, Hendrix, Oliver, Charlotte and the twins Alice and Piper. She is predeceased by her husband, infant daughter and son, granddaughter Audra Collier and son-in-law Gary Martin. She also leaves behind her Meadows family who gave her so much love and joy these last several years. Her family is grateful for the fine care she received there, allowing her to live with companionship and pass with dignity. Calling hours will be at Brookings and Smith, 133 Center Street, Bangor, Friday February 15 from 4 to 7pm. A funeral service will be held Saturday, February 16 at 1pm at the First United Methodist Church, 703 Essex Street, Bangor, reception immediately following. Those who wish, may make a contribution in her name to the Activities Fund of the Meadows, 110 Perkins Avenue, Old Town, Maine 04468. Burial will be in the spring. We encourage you to share your most beloved memories of Alice M. Dyer here, so that the family and other loved ones can always see it. You can upload cherished photographs, or share your favorite stories, and can even comment on those shared by others. Provide comfort for the family of Alice M. Dyer by sending flowers.